The U.S. Forest Service has announced plans to try to replace its aging fleet of privately contracted air tankers used to battle wildfires. Although the use of air tankers has drawn criticism by some who say the aircraft drive up costs to fight fires and are primarily a public relations exercise, the Forest Service is hoping to replace the existing airplanes — which are on average at least 50 years old — with newer, faster and more cost-effective ones. But the Forest Service does not specify in a 12-page modernization strategy when that change may occur. The announcement also comes in the wake of a decision eliminating four firefighting helicopters in California and Oregon. That decision has angered land owners in those areas, said Chris West, vice president of operations of Pac/West in Wilsonville, Ore., which represents the forest products industry. "The landowners are very upset because they won't have the (helicopter firefighting) coverage," he said. "Each of these communities and the adjacent wild lands have had a long history of catastrophic wildfire events, and given current predictions of winter precipitation in California, the outlook for the fire season is bleak," West said in an email to the Record Searchlight. Rep. Wally Herger, R-Chico, echoes the concerns expressed by West. Herger, along with four other Congress members, have sent a letter to the head of the Forest Service voicing their fears. "While we agree that tough decisions have to be made in this budget climate, we believe that programs vital to public health and safety should be given priority when determining where to allocate limited federal taxpayer dollars," the letter states. "Having aircraft readily available is critical to keeping fires small and dramatically reducing the overall firefighting costs." 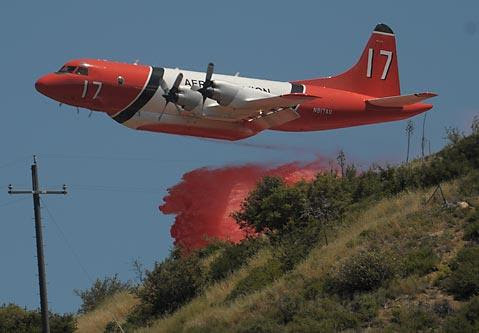 In its air tanker modernization plan, Forest Service officials said the agency now maintains a fleet of 11 large fixed-wing air tankers provided under contract by private aviation companies. The replacement move comes after at least three large air tankers have crashed since 2002, killing eight people. Forest Service Chief Tom Tidwell, who announced the agency's strategy earlier this month, said the aging fleet needs to be replaced with the next generation of aircraft. "The effectiveness of air tankers on a wildfire is directly proportional to its speed and load capacity," Tidwell said in a news release. "We need a core fleet of the next generation large air tankers to supplement our boots-on-the-ground firefighters for what we know will be longer and more severe wildfire seasons in years to come." Recommendations for the next generation of air tankers include the capability of carrying a minimum of 1,800 gallons of mixed retardant with more than 3,000 gallons preferred and a minimum cruise speed of 345 mph for quick fire response over long distance. Other recommendations include the craft being powered by turbine engines, which are more reliable, more fuel efficient, and require less maintenance than older aircraft piston engines, Tidwell said. The fleet has decreased in size from 43 in 2000 to only 11 under contract today, and 10 are facing a mandatory retirement by 2021. Still, Tidwell said, air tankers provided under contract by private industry "will continue to be essential in effective wildland firefighting." But the use of expensive air tankers, which can cost as much as $4,200 per hour to put in the air, has drawn fire by some who maintain they are primarily used to appease the public and elected officials, who think fires are not taken seriously unless attacked by the overhead tankers. Timothy Ingalsbee, executive director of the Eugene, Ore.-based Firefighters United for Safety, Ethics and Ecology, questions the traditional use of large air tankers, and the retardant chemicals they drop on fires, saying smaller surveillance craft to map and monitor fires may be more effective. "The needs of fire management have gone way beyond the need of fire suppression," he said Monday, adding that the single function of air tankers is too narrow, as well as astronomically high in both economical and environmental costs. Missoula-based Neptune Aviation now owns the largest fleet of large air tankers in the United States, with nine Korean War-era P2-Vs and a new BAe-146 jet tanker. A crack found in January in the wing of one of the P2-Vs grounded that plane. Its sister planes were inspected and certified for use. Nevada-based Minden Air Corp. provides two more P2-Vs for Forest Service firefighting. Aero Union Corp., which when in Chico was the largest air tanker firm, lost its contract with the Forest Service in a maintenance dispute last summer. The firm, by then based in Sacramento, later went out of business.